When ICED EARTH founder Jon Schaffer sets his mind to something, it happens. 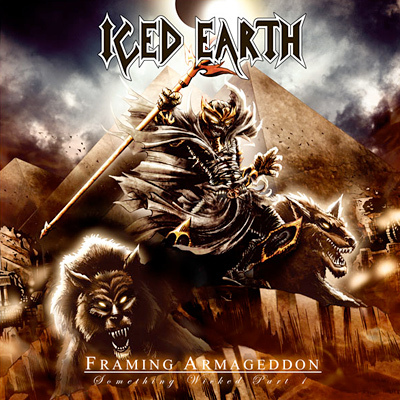 Ten years after the release of the “Something Wicked” Trilogy on the album SOMETHING WICKED THIS WAY COMES, a dream is finally being realized with the release of FRAMING ARMAGEDDON (SOMETHING WICKED PART I), ICED EARTH’s new studio album. And the emotional tale told here is a roller coaster ride for the listener. It’s a heavy metal sci-fi thriller of epic proportions, propelling one through a tale of evil and tragic loss, as well as the deception, patience and belief it takes to plan a reckoning. And all the while, we’re swept into the idea that our world is not as it seems. It’s actually not ours at all. Soaring Eagle Sound – Indiana, USA. February and March 2007 . Produced by Jim Morris and Jon Schaffer. Cover Art by Nathan Perry and Felipe Machado Franco. Interior Booklet Art by Nathan Perry, David Newman-Stump, Felipe Franco Machado. Layout by Felipe Franco Machado. Iced Earth logo designed by Jon Schaffer.